Sharron Angle, the Republican senatorial candidate appeared for five minutes as the warm-up act at her own rally last week in Las Vegas. 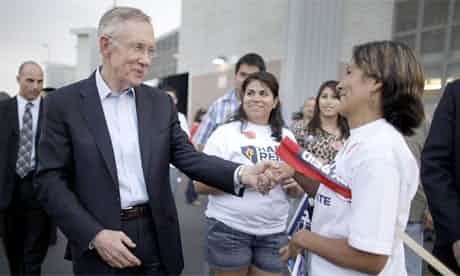 To the joy of the crowd, Angle taunted the Senate majority leader and incumbent, Harry Reid, to "man up" four times, implored her supporters to vote, said she knew "what the American dream looked like" and blew some kisses. If the economy really were the sole and overriding factor shaping the outcome of the midterms, then Democrats would be in far more trouble than they are. 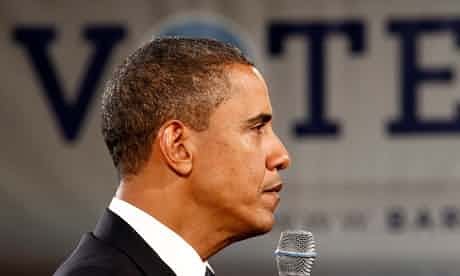 For the group that has suffered most economically under the nation's first black president is also the group they depend on most to get elected – black people. There is an episode of 30 Rock in which the rightwing CEO of a TV station, Jack Donaghy (played by Alec Baldwin), gives up trying to get his black employee, Tracy Jordan, to record a pro-Republican ad and persuades him instead to put out a call for blacks to simply not bother going to the polls at all. In his book Where Do We Go from Here? Martin Luther King recalls the only time that he was booed at a meeting. His hecklers were young black power supporters. "Unfortunately, when hope diminishes the hate is often turned most bitterly towards those who originally built up the hope … For 12 years I, and others like me, had held out radiant promises of progress … They were now booing because they felt we were unable to deliver on our promises … They were now hostile because they were watching the dream they had so readily accepted now turn into a nightmare." During a recent debate between the Colorado senatorial candidates in Denver, Republican Ken Buck gave his considered assessment of the occupation of Afghanistan. "It’s a fundamental mistake to assume that a people as backward as the Afghans are going to be able to build the industrialized nation and the democracy that it takes to be able to achieve what we would consider a Western-style democracy." Younge America: What happened to Obama-mania? Around three years ago, Joe Perez quit trying to restore his three period-piece Chevys (a 52 and two 68s) and dedicated himself to mending America's politics instead. After seeing Barack Obama's address to the Democratic convention in 2004 he pledged he would join the campaign if he ever ran for president. Tea Party supporters want to 'take their country back'. To where? The city emerges from the Arizona desert like a sprawling conurbation in search of an environmental impact assessment. Over the last 20 years Tucson's population has grown by 27% as thousands came looking for land, work and retirement. The two major demographic forces here for more than a generation have been those who came to start their lives over and those who came to die.